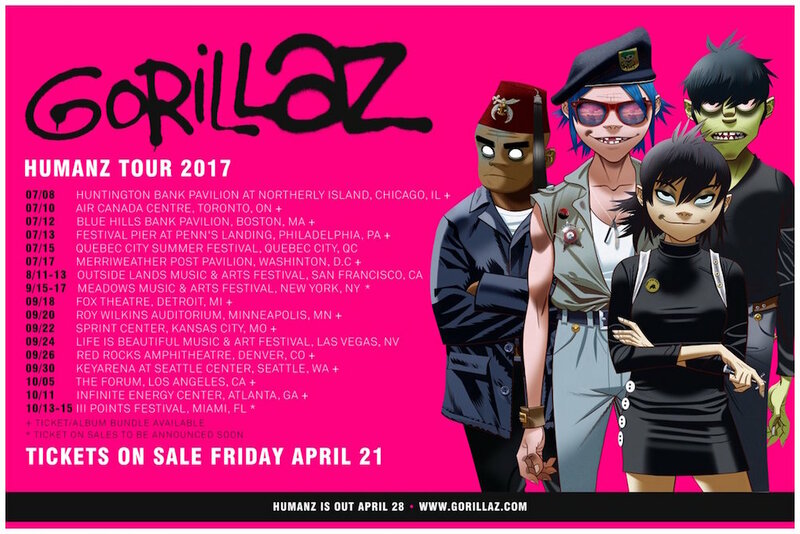 Gorillaz will be returning to North America for the first time in seven years this July for their 'Humanz' album tour. The 17-date run kicks off on Saturday 8th July at the Huntingdon Bank Pavilion on Northerly Island in Chicago, IL, before heading to Toronto, Boston, Washington, D.C., NYC, Las Vegas, LA and more. Gorillaz round off the trip in Miami, FL, headlining III Points Festival, which takes place from Friday 13th to Sunday 15th October. With the animated band's new 'Humanz' album set to drop imminently (28th April), events have been announced all across the world, including "Spirit House" experiences in NYC, Amsterdam and Berlin, and a festival in called Demon Dayz in the UK. It's not just music events the outfit have on the way either, with a TV series, clothing line and more in the works. Check out the full list of North American tour dates via the image below, and listen to Gorillaz latest album offering, featuring Pusha T and Mavis Staples, here.